The Jaggery Peanut Chikki is a quick and easy-to-make traditional Indian recipe. Chikki’s are a very popular as a snack and dessert in India; almost every town has its own variation of the recipe. This much-loved classic is a sure way to put a smile on anyone’s face. 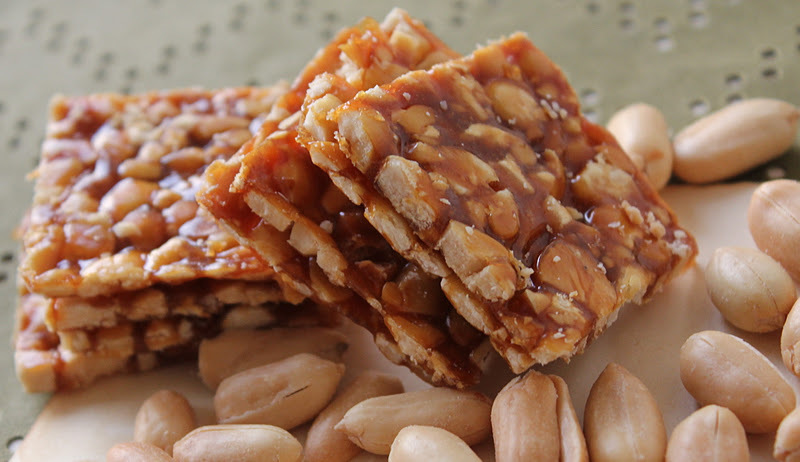 Break every peanut into half, so it is easy to spread in the chikki. Pour water in a heavy bottomed pan and heat it. Then add shredded jaggery and mix well. Melt the jaggery on low heat. Mix the jaggery and peanuts for 1-2 minutes on low heat and turn off the flame when it’s mixed very well. Grease a tray or any clean surface and spread mixture evenly to make chikki. When the mixture is cool, cut it into pieces of square and garnish with pista & badam.